Tonight (October 3rd) at the Downtown LA venue, the Mayan Theater, the PLAYING FOR CHANGE FOUNDATION, are hosting a a benefit concert called WE ARE ONE celebrating the organization’s 10th Anniversary. This event will feature performances by The Doobie Brothers, Paul Barrere, Fred Tackett from Little Feat, The Playing For Change Band, featuring 10 respected musicians from 10 different countries; world-renowned drummer James Gadson; and many others. This all-star concert and fundraiser for the Playing For Change Foundation, celebrates 10 years of positive change through music, supporting free music education for children across the globe. All ticket proceeds from the event going to Playing For Change Foundation, a separate 501(c)3 organization, established in 2007 in order to give back to the communities of the musicians met while filming these videos. Now embarking on its 10th year, the foundation has developed 15 music programs in 11 countries including South Africa, Rwanda, Nepal, Thailand, and Argentina, and serves more than 1,200 children. 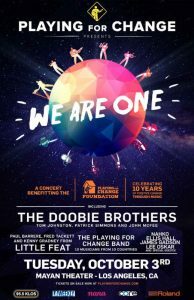 Playing For Change‘s new record, being released next year, features The Doobie Brothers along with more than 20 musicians from across the globe in a ‘Song Around The World’ version of the band’s iconic hit song, “Listen to the Music.” The video for this song will be premiered at the show. Official partners for the event include Los Angeles’ premier rock radio station 95.5 KLOS, LA Weekly, and Japan-based music app nana music. Playing For Change (PFC) is a movement created to inspire and connect the world through music, born from the shared belief that music has the power to break down boundaries and overcome distances between people. PFC’s primary focus is to record and film musicians performing in their natural environments and combine their talents and cultural power in innovative videos called Songs Around The World. From these videos they formed the Playing For Change Band-a tangible, traveling representation of their mission, featuring musicians met along their journey-and established the Playing For Change Foundation, a separate 501(c)3 nonprofit organization dedicated to building music and art schools for children around the world. Through these efforts, Playing For Change aims to create hope and inspiration for the future of the planet. For more information, please visit http://www.playingforchange.com/. Playing For Change Foundation, a 501(c)3 organization, was established in 2007, providing music education in areas that are culturally rich yet economically challenged. Children in countries around the world, from Africa to Latin America to Southeast Asia, attend free classes in music, dance and languages, taught by qualified local music teachers and led by regional administrators. Students learn about their own cultural traditions while employing technology to connect and share experiences with others around the world. For more information, please visit http://www.playingforchange.org/. The Doobie Brothers formed in San Jose, CA in the late 60s. Over the past five decades, they have sold over 40 million records with a string of hits that includes the songs “Listen To The Music,” “Jesus Is Just Alright,” “China Grove,” “Long Train Running,” “Black Water,” What A Fool Believes,” “It Keeps You Running,” “Minute By Minute” and more. 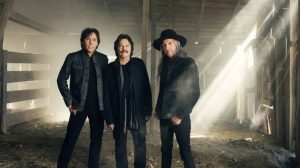 All Access had the pleasure of speaking with The Doobie Brothers’ founding member, Tom Johnston about this incredible event and much more. Let’s first talk about how you got involved with next week’s 10th anniversary of the Playing for Change Foundation. Well, actually, I know Peter Bunetta and I’ve known him since the early 70s, the middle 70s, whatever. He was involved with Playing for Change, and has been for years. I’m not sure he’s taking a big part in it now, but we ran into each other in Australia. We were down there playing the Byron Bay Bluesfest, and they were down there playing the Byron Bay Bluesfest. I ran into Peter and we were catching up on old times and stuff. He introduced me to Mark Johnson who was the guy who’s running the whole Playing for Change. This was in 2014. He just threw out there kind of casually, “What would you think about doing a video of Listen to the Music?” I said, “Sure man. That’d be fun,” because I’d seen the video they did with Stand By Me and I was really impressed by it. About a year went by. Peter and I kept in touch once in a while. Eventually he said, “Let’s cut that video. Let’s do that video.” Mark and his crew came out to the bay area because that’s where I live. We went and shot it in Mill Valley, at least my part of it. Then after that was done, he commenced to go around finding all these various people all over the world that he gets involved in his video, which is really interesting, playing lots of instruments. I don’t always know what they are sometimes or even work. He got this thing all finished up and they decided they wanted to, for lack of a better word, just kind of present it to the public in a somewhat large fashion. In other words, announce it, and also at the same time celebrate 10 years of doing Playing for Change. That’s where this gig came from. It’s such an incredible organization that really brings about positive change. That must be pretty rewarding for you guys to be a part of it once again. It is. They’re doing a lot of really great things, doing musical instruments, and music in general to kids around the world who are in impoverished areas and stuff. And, in general, doing a lot of good things for the public. I think it’s a worthwhile organization, so we were happy to do it. Originally just started off as a video. That’s all it was going to be. Then it kind of morphed into where we are now, doing the show, and a lot of the players who have been with Playing for Change. All these people playing at the show on the third, so some really great players. After looking at your tour schedule online it looks like that you guys are constantly playing live. I’m curious to know how, really, touring has changed for you guys. What do you still love about it today? Well, we’ve been on the road pretty much every single year since 1989 when we reformed again. It seems like it’s gotten even a little more intense the last couple of years. Although the odd thing is we’re not doing any more dates. It’s just the way we’re doing it I guess. We are out, we’ll say 85, 90 days a year, but it’s double that by the time you finish doing all the traveling. This year we’ve covered Australia, New Zealand, Japan, all over the United States a couple of times, Canada. We’re going to be going to Europe in about a month. Then we’ll finally be off. Then we start up again next year. How do you keep up the energy night after night? I don’t know. That’s the most honest answer I can give you. Drink a lot of espresso I guess. What are some songs that audiences continually request, that you have to play? You can’t do a show without it? What you would expect. Most audiences, no matter who the band is, want to hear the [inaudible 00:05:12]. If they’re not played people get very disappointed. So we always do and one of the greatest singles from this version of the band. We play one song that was the lifetime in the band, and kind of made it our own, if you will. But other than that, everything is before ’76 and after ’89. We’ve done three or four albums after ’89. We did all the ones most people know from The Doobie Brothers to Toulouse Street, Captain and Me, What Once Were Vices Are Now Habits, to Stampede, and then that’s when it changed and went to Takin’ It To The Streets. We’re doing a lot of different songs and we’re doing a lot of B-cuts too because it’s fun for us. We like to change it up and not share the same stuff all the time. We went out with Journey last year. I don’t mean the summer we just finished because after a while this all gets to be a blurb. In ’16, we went out with Journey. At that time we got together, spent about a week rehearsing and completely revamped the set. We’ve been using that for a couple of years. Even that’s changed a little bit. They want to hear Long Train Running, China Grove, Listen to the Music, Blackwater. Things like South City Midnight Lady have been asked for a lot. Things like Another Park, Another Sunday. Although we’re not playing it right now we have played it in the last couple of years. Just a lot of tunes like that, but they definitely want the stuff that got played on the radio a lot. Do you get to play your latest 2014 album, Southbound, at all? The Southbound was just songs we’d already cut. It was done with a lot of country artists. It was a mashup but it wasn’t anything new. The idea was to take the songs and re-record them in Nashville with some of the best musicians I’ve ever seen. I was blown away. We cut all the tracks in very very short order, like two takes per track, maximum, and it was done. There’s so many people in there playing at the same time that you didn’t have to add much. For all intents and purposes that was about it. Maybe a lead guitar once in a while or so. Then, after that, we added the guest artists. All the people that volunteered to come in and sing on the album. We had quite a few. It was really a fun project to do. We enjoyed that but we’re not, I mean, to do it in that fashion would be really tough to do in the first place. Because, as I mentioned, it was a lot of people playing. Like every track you had, besides bass, drum, and the guitar, two guitars, and we usually had a guy playing acoustic, Dobro or five-string, or whatever’s on top of whatever you were doing. Whoever wrote the song would be in the studio, and then the rest of it was all studio guys. Keyboards, pedal steel, on every song I had everything you could possibly think of. It was a lot of fun. The last studio album we did was World Gone Crazy. We have been occasionally playing some songs off that. We’re not currently playing songs off that but we will probably stick back in. It’s all revved up and ready to go. All we’ve got to do is put it in. Now we’re working on this new music. That’s exciting. How’s that going? Well, it’s not going very far because we’re never home. We have to be home to do that. We have already started it. We already went to John’s house. He has a full-on studio. Each of us has studios at our house, but they’re not like … John’s is more like a recording studio. Mine’s a writing studio. Pat has a writing studio. We take the songs down pretty far along. They’re pretty developed due to using software and computers, using to play bass, drums, guitar. You can play guitar into the computer. You can sing and do all the back … Put all your ideas down. So rather than walk in and well, here’s the chords, and then taking it from there, like the old days. It’s more or less here’s what the song goes like. Then we add the other guys in. They throw in their ideas and then we start taking it from there. We have started it but we did that one spade of it and then we hit the road again and we haven’t been back yet. It had to be put on pause. Yep, it did. We’ll get it there. We’ll get it there. Can you write on the road or is that too hard if you’re so busy? It’s too exhausting. You’re not in the right mental frame, at least I’m not out here. It’s like you’re constantly on the go. You’re constantly on the bus, or in a hotel, or at the gig. It really doesn’t lend itself to being creative. It’s more like just keeping up. Just staying on top of things and getting ready for the show and like that. I wait till I get home to do the writing. Yeah, that makes sense, for sure. 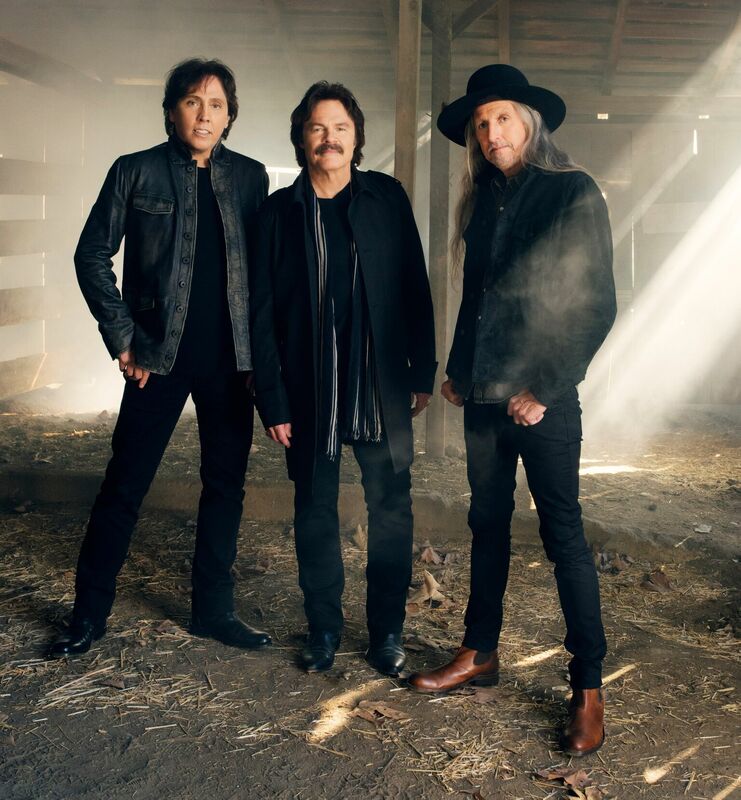 I’m curious to know how you think the social media craze has helped The Doobie Brothers reach more fans, and how it’s affected the way you interact with fans since you started making music? I guess you know this already, but we have all the regular stuff. Everybody has Facebook, Twitter, Instagram, all that kind of stuff. It’s just a way of reaching people, garnering new fans. People who might not have been familiar with the band before, due to having a friend say, “Have you ever heard blah, blah, blah, Have you gone to their site, or have you gone to their Facebook,” or if you’ve got an Instagram, or whatever. I think it really helps spread the name of the band and also the brand of the band. What the band is all about and has been forever. It’s basically what everybody else is doing, in other words. Everybody’s using the same stuff. Are each of you active on all those platforms or you have someone do it? Not personally. No. I mean, the band is active and we have guys running Facebook. They have Facebook, Twitter, and Instagram is run by some guys that work for us. Then there is also the website and the rest of it is … Well, that’s as far as the social media part of it goes. I don’t even have a Facebook account. It takes up a lot of time. It’s really neat for people that have the time to do that, but we’re on the go so much that I just can’t do it. I don’t do the Twitter thing. I don’t do any of that stuff. I guess I’m lagging behind I guess here. Shame on me? It’s such a great tool and people can hear about new music, or find out your tour dates, and everything. It’s great. It’s a great way to do all that for sure. Yeah. They can see videos and what have you. It’s a great business tool. It’s awesome. I think it’s really helped a lot. At this day and age, that’s imperative because there’s so many people out doing it now, compared to even 10, 15 years ago. It’s just exploded exponentially, the amount of people who are out playing, trying to garner attention. Not only through that platform, but also through YouTube and any number of ways. People don’t really put out albums anymore. They put out either EPs, or a single, or whatever. With streaming, everything really changed drastically because that was the end of physical product. Very few people buy CDs anymore, and very people … The downloads have even gotten to be old hat supposedly, even though people still do it. If I want to find a song I’ll do it occasionally, but for general listening everyday, it’s pretty much streaming. Well we’ve talked about some of the incredible musicians that you worked on just with creating Southbound so I’d like to know how that new blood on different songs has impacted you as a musician and the music that you want to create? God, that’s a hard one to answer believe it or not. I think anytime you have an experience with other musicians that you really admire and you’re moved by the stuff they do, or you’re blown away by how good they are, be it in a studio or be it live, if you’re touring with people, or whatever. I think it has an effect on you. I think this band has been around for a period of time that we’re pretty much, I don’t want to just say set in our ways only, but I think anything that gets added gets added on top of what we’re already doing. I would say that we’re affected by that. I will say, as a writer, and I do a lot of songwriting, I have done some things recently, when I say recently I mean the last five years, that were all brand new to me. Like going back to Nashville and writing with two or three people at once. I have never done that before in life. I’d always written everything by myself. That’s the way it was. It was really interesting. It’s kind of expands your horizons and how you think. It’s a pretty cool thing to do. Other things are … Oh God, let me think. Just watching somebody play, listen to various sing. I mean, I know what all my influences were coming up and they’re still basically what I’m all about, I guess. Appreciation of other people’s music is always imperative to me. It just comes naturally and you can’t help it. I mean, doing those classics, for instance, which we have another one coming up here on the 30th. I never got to watch a lot of those guys live. We did tour with Steely Dan back in the early 70s, but that’s the last time I’ve seen them. Unfortunately, Walter passed away. That’s a drag. But Donald is soldiering on and they sounded great. I hadn’t heard The Eagles since in the 70s also, other than on radio. I actually own some of their stuff. It was really great to watch them live. I didn’t get to watch the second night, unfortunately, which had all the other bands, Earth, Wind & Fire. Journey, we toured with so I got to know them very well. Anyway, I didn’t get to watch the second night because we always had to be someplace else playing. I only got to do it in New York. The first night in L.A. we played, walked off the stage, got on a plane, and flew to Detroit and had to play the next night. That’s the way it’s been on each one of those, although in New York, we had a day off. It wasn’t a day off. We played and we had the rest of that day so we could stay and watch the whole show. That was, believe it or not, it was … Well, it was not only impressive. You can’t help but be affected by that. It’s just really great to see that kind of production, hear that kind of music. Then you put that in comparison to what’s going on today. You see how it all fits or doesn’t fit, or what’s new. Man, I’ve got to tell you, there is a lot of different styles of music out there. What do you hope your fans continue to take away from your music night after night on these shows? Is there something that you hope that they’re, a message that they’re taking away? I think one of the things is that we really enjoy doing what we do. We try to communicate that to the crowd. By getting them involved when they sing along on songs they know and stuff. They’re up dancing around. It’s like you know you’ve reached your crowd. That’s basically, I consider that the art form. Because I think interacting with a crowd, getting them involved with the show, so to speak, by reacting and expressing themselves, however you want to put it. They’re the most important thing that you can do. They understand the fact that when they watch us, and I hear this observation nightly. Like, “You’re having a ball up there. You really love what you do.” I said, “Yes we do and we consider ourselves very fortunate to still be able to go out and do all this.” The career hasn’t died. We’re still doing it. Do you think it keeps you young? I think you don’t ever grow up. I mean, it doesn’t mean you’re not responsible. It doesn’t mean that you’re not … I’ve got a wife and kids and all that kind of stuff. It doesn’t mean that you don’t pay bills, you don’t take care of business like everybody else. But when you start playing, you’re still 25. That’s just the way it is. Kind of your mind set I guess, you know? My last question for you is, is there a piece of advice that you would give to a young band or a young person who really wants to be a musician and they’re working hard at it? What’s one piece of advice you would give them? It’s much harder now to give that kind of advice than it was like 15, 20 years ago, whatever. Simply because, in my book, there’s two or three biggest things. There’s so many people trying, what we used to call, getting through the door. We wanted to get through the door and make it, etc. When we started, it was called a door. Now it’s more like a postage stamp. It’s 40 million people trying to get through this little space. Way more people than were trying back then. They’ve been encouraged by TV shows like all the competition shows and all those types of things that, “I can do that. I can do that.” There’s also just a lot of people have taken up studying it in school for instance, and all these other kinds of things. Really, the only thing I can offer now is practice, be good at your instrument, your vocals. If you’re just a singer, of course then vocals are the most important thing to you. It’s good to have an instrument to play as well, but if you don’t, it’s not a sin. Writing has become hugely important to the companies, the record companies, and whoever else. Didn’t used to be that way but it is now. We always have. We didn’t think about it but nowadays it’s imperative, even though there’s a lot of people out there writing songs for people who are very popular. It’s basically all about getting a following. That hasn’t changed since the old days, it’s how you achieve it. One of the ways is what you were talking about a while ago, and that is social media. The other thing is playing as often as you can and give people the photograph, videos, whatever. Get it up on YouTube. Get it up on all the various social media sites. That’s now become imperative. That didn’t even used to exist, so it wasn’t part of it at all. But now you have to do it. If you can get something on Spotify, because they do that. They take new artists that people don’t know and they play them. That’s a great way to get huge amounts of exposure. It’s all changed and it’s changed drastically. The basics are still the basics. You’ve got to know what you’re doing. First of all, don’t do it because you want to be famous. Don’t do it for that reason. That’s the worst idea I can think of. You should do it because you really love playing. If you’re not doing it for that then you shouldn’t be probably doing it. If you really love playing music and you think you want to make this your way of making a living, or whatever, then you’ve got to dedicate yourself to the following with all the things that I just mentioned. Wise words for sure. Well, thank you so much for your time Tom. I really appreciate it. I’m sorry it was early. I look forward to seeing you guys tonight at the Playing for Change event! Okay. Yeah, we’ll look forward to seeing you too. Should be an interesting evening.